On 1st October 1950, 890 officers and men of 1st Battalion, The Gloucestershire Regiment, led by Lieutenant-Colonel J.P. “Fred” Carne, set sail from Southampton bound for Korea. The Glosters formed part of 29th Independent Infantry Brigade Group, with 1st Royal Northumberland Fusiliers, 1st Royal Ulster Rifles, 8th King’s Royal Irish Hussars, C squadron 7th Royal Tank Regiment, 45th Field Regiment Royal Artillery, 11th Light Anti-Aircraft Battery Royal Artillery and 170th Mortar Battery Royal Artillery, together with supporting arms and services. The formation was under the command of Brigadier Tom Brodie, and the men were a mixture of Regular soldiers, Reservists and National Servicemen. When 29th Brigade Group arrived in Korea on 3rd November 1950, U.N. forces had already scored a striking success against the North Korean Communist forces and, after the Inchon landings, had advanced as far north as the Yalu River, close to the Chinese border. This advance had created its own very serious problems and brought Communist China into the war. “. . . the three of us settled down for a long wait. It was a nice clear night and gave us a good field of vision for about half a mile east and west. We had decided that we would have two on observation and the other would sit with the ‘phone, changing each hour. The terrain over which the Glosters were to fight over the next few days was ideally suited for defence, but the Glosters were very thinly spread on the ground. Colonel Carne had positioned his limited resources carefully. “A” Company under Major Angier was on the left, holding Castle Hill and overlooking Gloster Crossing on the Imjin; 1,500 yards to the south-east was Major Wood’s “D” Company at Point 182; further east was “B” Company led by Major Harding; “C” Company under Major Mitchell was in reserve near Battalion Headquarters at Solma-Ri with supporting mortars. Two miles to the Glosters’ right were the Royal Northumberland Fusiliers (1 RNF), with the Royal Ulster Rifles (1 RUR) behind them in Brigade reserve. Ahead of 1 RNF on the north side of the river was the Belgian United Nations Command, which comprised of a Belgian battalion with a detachment of Luxembourg soldiers, attached to 29th Brigade Group. To 29th Brigade Group’s right was U.S. 65th Regiment, and to their left was Republic of Korea (ROK) 12th Regiment. The Chinese offensive began in earnest on 22nd April, 1951. A battalion of 559 Regiment, 187th Division advanced across the river opposite Lieutenant Guy Temple’s ambush patrol from “C” Company at Gloster Crossing late that evening. The Chinese took heavy casualties from Temple’s men and supporting artillery until Temple was forced to withdraw as his party’s ammunition began to run out. Another battalion attacked “A” Company on Castle Hill and, when Temple withdrew, “D” Company’s position came under attack. By daylight on the 23rd April, the situation for 29th Brigade Group had become extremely hazardous. Colonel Carne could not withdraw his hard-pressed men without exposing 1st ROK Division’s right flank and any retrograde movement would also put 1 RNF at risk, as well as the Belgian Battalion which was itself under heavy enemy pressure. But the Glosters themselves were increasingly in danger of being surrounded. The summit of Castle Hill was captured by the Chinese at 07:30, and another Chinese regiment began to envelop the Glosters’ forward Company positions. Even after the loss of the summit of Castle Hill, “A” Company still stood and fought, while their numbers were being steadily depleted. It was at this time that Lieutenant Philip Curtis, on attachment from the Duke of Cornwall’s Light Infantry, was killed in a selfless act of heroism which would be recognized with the posthumous award of a Victoria Cross. At 08.30 “A” Company, now reduced to one wounded officer and 53 men, withdrew under heavy fire to Gloster Hill, west of the village of Solma-Ri, led by Company Sergeant Major Gallagher. Colonel Carne had been forced to draw in his horns and concentrate his battered battalion around the Solma-Ri position in the morning of the 23rd. The Glosters’ flanks had been turned, and Carne’s isolated Companies were in danger of being overrun piecemeal by the seemingly inexhaustible reserves of men that Chinese 63rd Army were throwing against them. The Glosters, with the magnificent support of British and American artillery, had inflicted fearful casualties on successive waves of enemy attackers throughout the night and early hours of the morning and, by concentrating his battalion, Carne could still expect to further impede the enemy’s progress before they broke through. If nothing else, the sacrifice made by the Glosters would buy valuable time for the rest of I Corps forces to withdraw in good order. “D” Company was pulled back alongside “A” Company on Hill 235 (Gloster Hill) and Battalion HQ, with Support Company to their front. On the eastern side of Solma-Ri, “B” Company was withdrawn to take position on the high ground of Hill 314 with “C” Company to their left. Daytime gave some breathing space, but now the Glosters were completely surrounded by the enemy’s 189th Division, which had taken the place of the mauled 187th. The rest of 29th Brigade Group faced the Chinese 63rd Army’s third division, the 188th, and the remnants of 187th. The assault on the Glosters recommenced with new ferocity in the late evening of the 23rd. 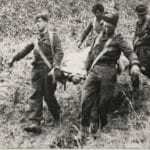 Once again, successive waves of Chinese soldiers attacked through the night and uphill, taking heavy casualties while concentrating at first upon “B” and “C” Companies. The enemy managed to separate the two companies on Hill 314, driving “C” Company from its position around 3.30 a.m. Colonel Carne ordered an evacuation of Hill 314, and those men of “C” Company who were able made their way to Hill 235, where the Battalion would concentrate with “C” Troop 170th Mortar Battery. “B” Company continued to hold their ground, before those who could joined the rest of the Battalion on Gloster Hill later . “. . . we hatched a plot to re-open the route to the Gloucesters. Soon after dawn on the 24th this scheme was put into action. We were a very mixed force; Centurion tanks of the 8th Hussars, Filipino infantry, American light tanks [M24 Chaffees of the Philippine 10th Battalion Combat Team] and the “rag-tag and bobtail” which I had managed to assemble from the remains of F. Echelon, trailing along behind. “Our old position at F. Echelon was reached without difficulty; the enemy had abandoned it. Then the Filipinos disappeared into the hills and the mobile column moved up the track. Over the stream and up the hill, past Kwangsuwon and down into the gorge. At the very narrowest point, one of the light tanks was hit, swung across the track and blocked it. The mobile column was halted. In the hills, we could hear the Filipinos tackling more than they could manage. The relief column had failed. ” . . . With our tails between our legs we returned to Brigade headquarters to find that John Watkin-Williams with the Sappers were organizing a light-aircraft drop to the battalion. Requests had been coming over the wireless from the battalion for things they desperately needed; particularly ammunition and wireless batteries. The least we could do was try. Volunteers were required to act as “droppers”. It was a brave thing to do, fly low in a slow light aircraft over hills which teemed with enemy. But bravery was commonplace in those days. “. . . Throughout the entire engagement, Lieutenant-Colonel Carne, showing a complete disregard for his own safety, moved among the whole battalion under very heavy mortar and machine gun fire, inspiring the utmost confidence and the will to resist, amongst his troops. “On two separate occasions, armed with a rifle and grenades he personally led assault parties which drove back the enemy and saved important situations. However, Lieutenant-Colonel Carne’s example of courage, coolness and leadership was felt not only in his own battalion, but throughout the whole brigade. “He fully realized that his flanks had been turned, but he also knew that the abandonment of his position would clear the way for the enemy to make a major break through and this would have endangered the Corps. “. . . We then saw UN tanks ahead, and crawled and ran in turn eagerly ahead and got to within five hundred yards of them, but they mistakenly took us for Chinese and opened rapid fire with HMGs and 75mm cannon, and our six leading men fell. Shouts from the rear of our thinning column told us clearly that Chinese were in pursuit and shooting and bayoneting the men at the tail, mercilessly killing what were now, unarmed soldiers. We were now compressed between the Americans and Chinese and halted, when we needed to move forward more rapidly to save the men at the rear. “In near desperation I fixed my beret and face veil to a stick and waved it frantically at the tanks hoping it would be recognized? The next burst of fire shot it away! Hiding our identity leaving Gloster Hill had been sound, but now backfired as the Americans could not identify us either! Captain Harvey’s group had descended Gloster Hill a hundred and four strong, but only forty-six managed to reach the safety of the UN lines. “All is quiet; not even the sound of distant gunfire breaks the stillness tonight. On tiptoe, we leave the village, pausing every few yards to listen for sentries. Someone coughs nearby. We freeze in the shadows that hide us, waiting for a challenge or a step towards us. A voice calls out in Korean. We do not reply. Apparently he is satisfied, for the challenge is not repeated. We reach the foot of the hill and begin the ascent. As we climb higher, the wind catches our hair and torn garments. Now there are torches flashing below; is our escape discovered? We hurry on, careless of the thorn bushes that scratch us as we force our way through them. Fox is calling me. “After his orders to the battalion to break out, Brigadier Brodie entered in the Brigade operations log in a moment of high emotion, ‘No one but the Glosters could have done it.’ This was flattering but not true. The other members of the brigade fought no less well. Neither they nor the Glosters sought to be heroes; only to acquit themselves honourably and competently, one among another. Picture: – Glosters bring in a wounded man.